This album probably kept lingering in the vaults of Conrete WeB, since I’ve just received it to review. 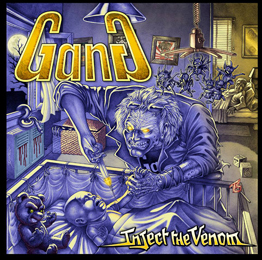 Gang is a French band that released 4 albums and demos in the 90ies. As a matter of fact this band arose from the ashes of Gush X, and who finally released their fifth album ‘V’ in 2010, after which it did not become silent around this band, since they continued playing, but did not release any new albums up to now. What they play is mostly old school heavy metal, but with a touch of trash. I don’t know what it is with French heavy metal bands, but just like in the 80ies with bands like Satan Jokers, Warning, H-Bomb to name but a few, this band also has a vocalist with a rather high pitched voice, although not on all the songs. Lots of older metal bands spring to my mind when listening to this album, some Saxon, some Judas Priest, even some Riot, as you can see all bands who became famous in the 80ies. They also do a cover of Tokyo Blade’s ‘If Heaven is Hell’, and are assisted on this song by Tokyo Blade’s original vocalist Alan Marsh. There’s also the ubiquitous instrumental song ‘Midnight’ on the album. To sum it up : this album sounds like it came out thirty years or so ago. Nothing spectacular, but decent music, that brings me back memories of my youth.